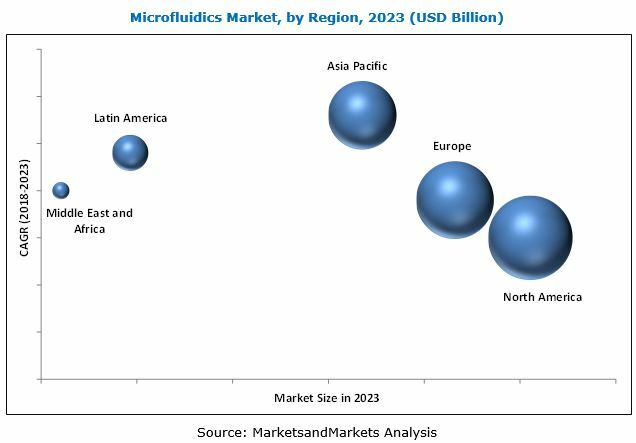 [228 Pages Report] Microfluidics market is valued at 8.28 billion in 2017 and is expected to grow at a CAGR of 22.6% during the forecast period, to reach to USD 27.91 billion by 2023. Base year considered for the report is 2017 and the forecast period includes 2018 to 2023. The increasing incidence of other major chronic and infectious diseases, coupled with advancements in coagulation tests, blood gas electrolytes, hematology, urine chemistry, and cardiac markers, are creating new avenues for the growth of the microfluidics market. There is a growing demand for the integration of the microfluidics technology in POC diagnostic devices, manufacturing, fluid-handling schemes, and signal-detection procedures. This is further expected to drive the demand for microfluidics technology in the coming years. To track and analyze competitive developments such as joint ventures, alliances, mergers & acquisitions, new product/technology developments, and R&D activities of the leading players in the Industry. The global microfluidics market is projected to reach USD 27.91 Billion by 2023 from USD 10.06 Billion in 2018, at a CAGR of 22.6%. Rising demand for point-of-care testing due to the rising incidence of chronic infectious diseases, fast returns on investment on the purchase of equipment integrated with microfluidic technology, faster testing and improved portability through microfluidic chip miniaturization, and entry of new players with innovative microfluidics technology & launch of new and advanced products embedded with microfluidics technology are some of the major factors attributed to the growth of the global market during the forecast period. However, there are certain challenges in incorporating the microfluidics technology into existing workflows. This coupled with the presence of complex and time-consuming regulatory standards are the factors restraining the growth of this market up to some extent. This report analyzes the market by application, component, material, and region. Based on application, the market is segmented into in vitro diagnostics, pharmaceutical and life science research, drug delivery, and laboratory testing. By application, in vitro diagnostics segment accounted for the largest share of the market in 2017. High prevalence of infectious and lifestyle diseases, relatively lower turnaround times exhibited by POC testing and clinical diagnostics compared to central lab testing methods, rapid rise in aging population, and the introduction of technologically advanced products are some of the key factors attributed to the large share of this market during the forecast period. By type, the microfluidics component market is segmented into microfluidic chips, microfluidic sensors, micropumps, microneedles, and others. The microfluidic chip segment accounted for the largest share of the market in 2017. 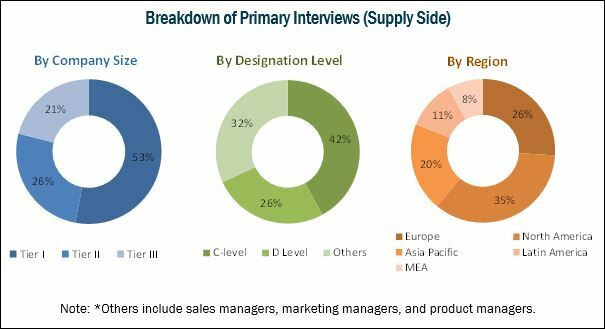 High demand for POC testing, rising use of personalized medicine, rise in drug discovery and life science research, and high demand for high-speed diagnostics are responsible for the large share of this market. By material, the microfluidic component market is segmented into polymer-based microfluidics, glass-based microfluidics, silicone-based microfluidics, and other material-based microfluidics. The polymer-based microfluidics accounted for the largest share of the market in 2017, owing to its greater preference for polymers as a substrate in microfluidic devices among manufacturers. Geographically, the market is segmented into North America, Europe, Asia Pacific, Latin America, and the Middle East and Africa. North America holds the largest share of this market in 2017. Compared to Europe and Asia Pacific, North America has various additional advantages such as investment initiatives by the government and presence of high-quality infrastructure for clinical and laboratory research. The rising healthcare and R&D expenditure is one of the key factors driving the growth of the market in North America. However, North America is highly regulated with stringent and time-consuming approval processes that are expected to inhibit the growth of the market in North America. Some of the prominent players in the microfluidics market include Danaher (US), Thermo Fisher (US), PerkinElmer (US), Agilent (US), Bio-Rad (US), Becton, Dickinson and Company (US), Roche (Switzerland), Illumina (US), Fluidigm Microfluidics (US), and QIAGEN (Netherlands). Other key players include Dolomite Microfluidics (UK), GYROS PROTEIN TECHNOLOGIES AB (Sweden), Sphere Fluidics (UK), OPKO Health (US), Waters (US), thinXXS Microtechnology (Germany), Abaxis (US), bioMérieux (France), Abbott (US), Dolomite Microfluidics (UK), Microfluidic ChipShop (Germany), Elveflow (France), Cellix (Ireland), Micronit Microtechnologies (Netherlands), MicroLiquid (Spain), MiniFAB (Australia), uFluidix (Canada), Micralyne (US), and Fluigent (France).